TRE KVINNER VANT OVER TRIDENT!!! 20. oktober frikjente en skotsk domstol de tre kvinnene Angela Zelter (48), Ellen Moxley (63) og Ulla Røder (45) som tidligere i år i en ikkevolds-aksjon ødela utstyr for £ 100.000 beregnet til å styre britiske atomraketter montert på landets Trident atom-ubåter. Dette er en stor seier for fredsbevegelsen, og et like stort nederlag for Storbritannias atomvåpenpolitikk. Som journalisten Gerard Seenan skrev i den kjente avisen The Guardian 20. oktober "..står den britiske regjeringen nå overfor et krav om øyeblikkelig å revidere sitt atomvåpenprogram etter at en skotsk dommer har dømt Trident ulovlig ifølge internasjonal lov." De tre tiltalte kvinnene hadde prosedert tungt på at det var regjeringens atompolitikk som var i strid med internasjonal rett, og at aksjoner for å dra oppmerksomhet til dette var straffrie. De viste primært til avgjørelsen i den internasjonale domstol i Haag 8.7.96 som understreket at også atomvåpen må overholde alle regler i krigens lover og sedvaner. En av de tiltalte spurte om man burde vært dømt for tilsvarende aksjoner mot Hitlers forbrenningsovner. Den britiske regjering hadde i saken ikke gjort noe forsøk på å hevde at folkerettmessig bruk var mulig, mens NATOs standpunkt etter frifinnelsen er som før; at alliansens atomstrategi er helt i pakt med det Haag-domstolen fastslo om gjeldende folkerett og atomvåpnenes karakter. Den skotske dommen falt bare et halvår før traktaten om ikkespredning av atomvåpen (Non Proliferation Treaty, NPT), - som er sterkt knyttet til å få i gang forhandlinger om å avskaffe atomvåpen som fenomen - skal tas opp under tilsynskonferansen i New York i 2000 (Year 2000 NPT Review Conference). Firstly the three accused consider Trident was being used illegally based on an understanding on what international law said and on advice given to them; if they were right that the use and threat of nuclear weapons was illegal, not just possession, then they had a right given the enormity of the risks of nuclear weapons to try and do something to stop that illegality. Secondly they had an absolute necessity, in which case it didn't matter whether Trident is illegal or not, the necessity was there. In considering this I have really not a great deal to go on other than what the ICJ (Haag-domstolen. red.) said in 1996 and their opinion, which although advisory, acknowledges in words what is authoritative and agreed by all. On the face of it very careful consideration should be given to its terms. In reaching their opinion the ICJ based the opinion on all the body of law that went before it which was carefully outlined. That law was canvassed in court. The opinion did not say possession of nuclear weapons was illegal, nowhere does any law say that. Even our own High Court of Judiciary has said that possession of nuclear weapons is not itself illegal. They did not consider the law except as far as it related to possession. The Helen John case can be distinguished. Here there is a defence of international law and necessity, but the whole defence hinges on the use made of nuclear weapons now and the percieved threat or threats made by the nuclear state. The use or threat of use, I would conceed that the ICJ did not say that in all circumstances threat or use of nuclear weapons was universally prohibited. Equally there no conventional law that authorises the threat or use of nuclear weapons. They issued what may be considered an enigmatic decision which has been read on a number of occassions "the threat or use of nuclear weapons would be generally contrary to the rules and principles of international law applicable in armed conflict and in particular the principles and rules of humanitarian law. However, in view of the current state of international law and of the elements of fact at its disposal, the Court cannot conclude definitively whether the threat or use of nuclear weapons would be lawful or unlawful in an extreme circumstance of self-defence, in which the very survival of the State would be at stake." The last words are important. We do not know what they meant by generally, but their final conclusion implies that the use or threat could only apply in very tight circumstances of self defence the very survival of the state. The President of the ICJ said "I cannot overemphasise that the inability of the court to go further than the formal pronouncement at which it has arrived cannot in any way be interpreted as a half-open door to recognition of the legality of the threat or use of nuclear armaments." Also the way in which the judges voted showed that a majority voted against the use of nuclear weapons. "Turning to the central matter the judges were divided until the President's casting vote. The court decided that the threat or use of nuclear weapons is unlawful under all circumstances except last resort self-defence to avoid annihilation. Three of the judges dissenting took the opposite view to the other four dissenters. Four said that nuclear threat or use in not unlawful. The other three considered that nuclear threat or use is always unlawful. It follows that an absolute majority of 10 out of 14 judged that the threat or use of nuclear weapons is either entirely illegal or generally illegal subject to one possible exception. A two thirds majority rejected the general lawfulness of nuclear weapons." I have the ividious task of deciding on international law as it relates to nuclear weapons. I am only a very junior sheriff without the wisdom or experience of those above me. I have a knowledge of the repercussions could be far reaching. As a sheriff I took an oath to act without fear or favour in interpreting the law. A point of international law has been raised here and I have to answer it. I take comfort from the fact that there are other higher courts which can rectify any mistake. Lord Murrays article concludes "there then are the principles on which the lawfulness of the proposed use of a particular weapons are to be assessed .. to be noted that in so far as they consist of international customary law they are part of the domestic laws of this country." 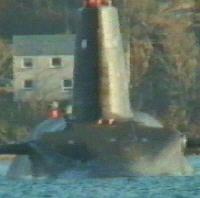 of indication from any government official then or now that such use fell into any strict category suggested suggested in the ICJ opinion .. the threat or use of Trident could be construed as a threat, has indeed been construed by others as a threat and as such is an infringement of international and customary law. The three took the view that if Trident is illegal, given the horrendous nature of nuclear weapons, they had the obligation in terms of international law to do whatever little they could to stop the deployment and use of nuclear weapons in situations which could be construed as a threat. It follows, if I consider that Angie Zelter, Ulla Roder and Ellen Moxley were justified in the first leg of their defence and having given that as the principle reason the crown has a duty to rebut that defence. They have not done so and so I uphold the three defence submitions in so far as they refer to malicious and willful damage. I uphold the comments of Mr McLaughlin with regard to malice. Gordon says "no act is punishable unless it is committed with a criminal mind ..."
I have heard nothing which would make it seem to me that the accused acted with criminal intent. Therefore I will instruct the jury that they should acquit all three accused on charges 1 to 3 which leaves only the alternative in charge 4, they should also be acquited on the first alternative in charge 4. If anyone else takes such action they do so at their peril. The law is not clear on nuclear arms. I may be totally wrong. If it goes to appeal I may not be upheld and every case depends on whatever circumstances. What I have said is with regard to the very special circumstances of this trial and in the light of international tension around June 8th. "This Scottish Judge was very bright, very thorough, and very professional--one of very best i have seen in 17 years of doing these cases. Given the fact that there is NO evidence in support of Trident-2 in the trial record put in by the Government, it might not be a very smart thing for the UK government to appeal."